This is another of Superscale's USN Air Wing sheets. 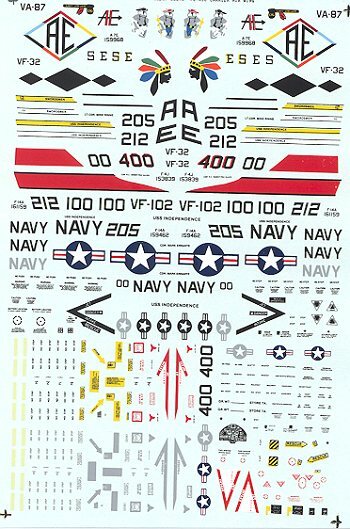 Frankly, I liked them as it gave markings for more than one type of aircraft on it, and if one felt so inclined, one could do all the markings on the sheet for a theme. Now, if you long-time readers are having a bit of deja vu concerning this sheet, you should as a LONG time ago, I reviewed the 1/48 version 48-186. That sheet was very similar, but being in 1/48, it only had two subjects and not the four that are supplied with this one. 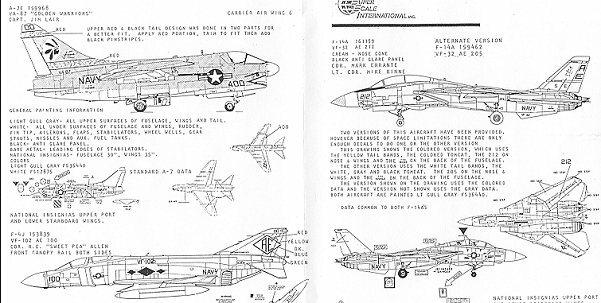 Since the A-7E and hi-viz F-14A are covered on that sheet, you can read it there. One item new on this sheet is a low viz version of the VF-32 Tomcat. Basically, you swap out the colorful markings for ones in grey and white. You also use different modex and serial numbers. The other aircraft that you get is an F-4J. This aircraft is in overall gloss gull grey and all markings except for the tail markings are in black. Actually, it would make a nice model as the light grey is pretty bright and is easy to paint! Review copy courtesy of me and my now empty wallet! If you would like your product reviewed fairly and quickly by a site that has over 1,300 visits a day, please contact me or see other details in the Note to Contributors.